Thanksgiving is almost here, the glorious holiday when many Americans will spend the entire day sweating in the kitchen—and quite possibly several additional days prior to that, stressfully prepping. As for the big day itself, that oversized fowl will take three to five hours to cook, depending on its girth, and then there are side dishes to prepare and pies to bake. So many side dishes and pies! After a brief reprieve to actually peck at the food, you’re back in the most important room in your home to clean up a monumental mess. Even apart from Flightless Bird Consumption Day, Americans are spending more waking hours in the kitchen—cooking, eating, and socializing—than ever before. That’s why the kitchen has become the most obsessed-about and downright valuable room in real estate. But we want details! So we decided to tap our ever-hungry data team to dive into the statistics and apply some cool, hard numbers to this hot obsession. What we discovered: some fascinating facts about the way we cook and eat today, how that shapes the features we want in our home kitchens, and how they drive the prices that we’re willing to pay. Let’s head to the SousVide machines! Kitchen confidential No. 1: A trophy kitchen sells your home better than anything elseOnce a small, functional space tucked away at the back of the house, the American kitchen has emerged as the showpiece of the home. Top-of-the-line-appliances, rich cabinets, and shining stone countertops have become status symbols. And catnip for home buyers. “It’s almost not worth calling it a kitchen anymore—it’s a living room that you can cook in,” says Christopher Peacock, a high-end cabinetry designer in Norwalk, CT. In real estate, the data proves that the kitchen has become the most important room in home buying and selling. 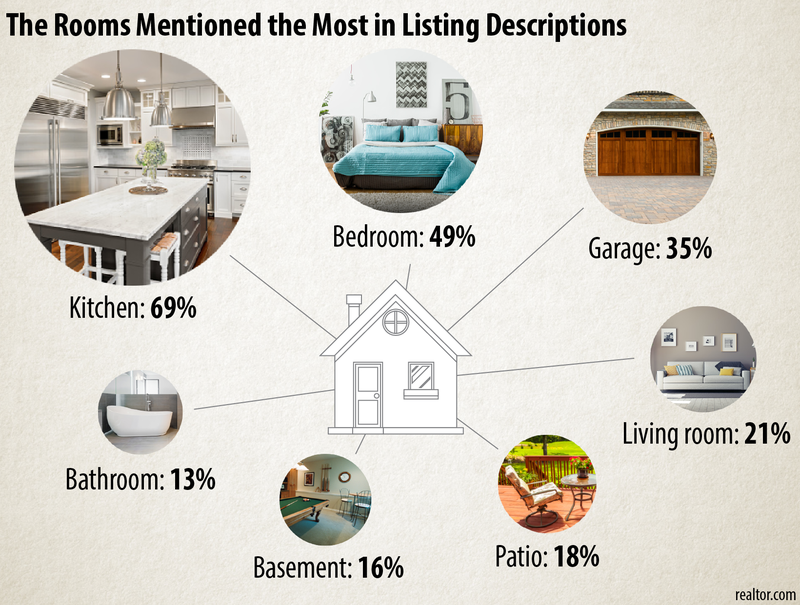 Of all homes listed for sale on realtor.com®, 69% of them tout the kitchen as a selling point in their descriptions, compared to 49% that mention the bedrooms and 21% that mention the living room. Homes that include a “killer kitchen” or “luxury kitchen,” as described by the sellers, sell 8% faster than similar-sized homes in the same ZIP code. And that’s why they’ve become a key part of renovation plans, home decor upgrades, and listings descriptions. Vive la cuisine! You can turn out a holiday meal from a cramped galley kitchen, but would you want to? 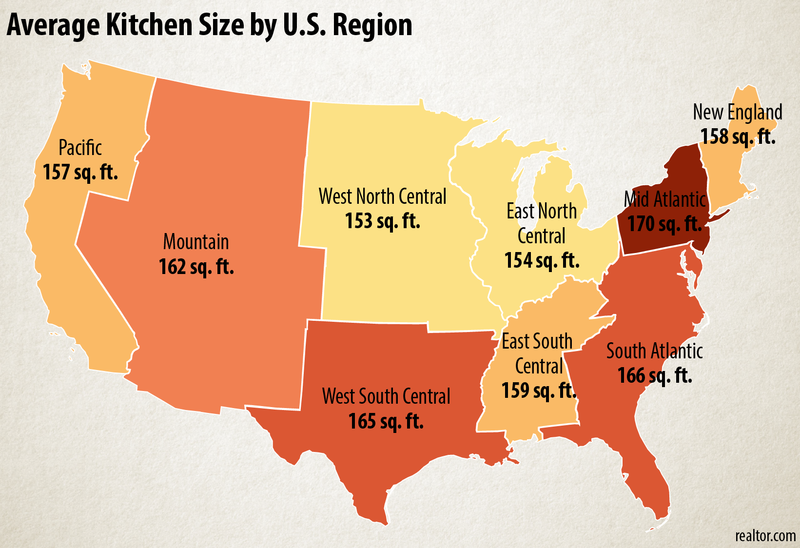 Across the United States, the size of home kitchens varies by region. And you might be surprised to find out which regions of the country love their kitchens the most. Homes in the Mid-Atlantic region—New York and Pennsylvania—have the largest kitchens (at an average of 170 square feet); while the wide-open West North Central region—the Dakotas, Minnesota, and Iowa—have the smallest kitchens (153 square feet), according to a report from the American Kitchen and Bathroom Association. While larger homes tend to have larger kitchens, the scale of the increased kitchen size is not proportional to the overall home, the report notes. “We see extra space in the Mid Atlantic, where people are more affluent, and prime land is relatively inexpensive. In the Southwest, where families are bigger and need a bigger kitchen. And, of course, everything is bigger in Texas,” says Javier Vivas, realtor.com’s economic researcher. High-end kitchen mania is not universal, however. In America’s heartland, people appear to be less enthusiastic about investing in a luxury kitchen. Affordability, efficient layout, and outdoor features are more appealing to these folks. More of them are maximizing the utility of a small kitchen with clever organizers, like racks that can be attached to a drawer. A rolling island, which can be used both as a prep area and dining surface, is becoming a popular way to save sanity on Thanksgiving Day, says Heidi Féliz-Grimm with Martha O’Hara Interiors in Minneapolis. 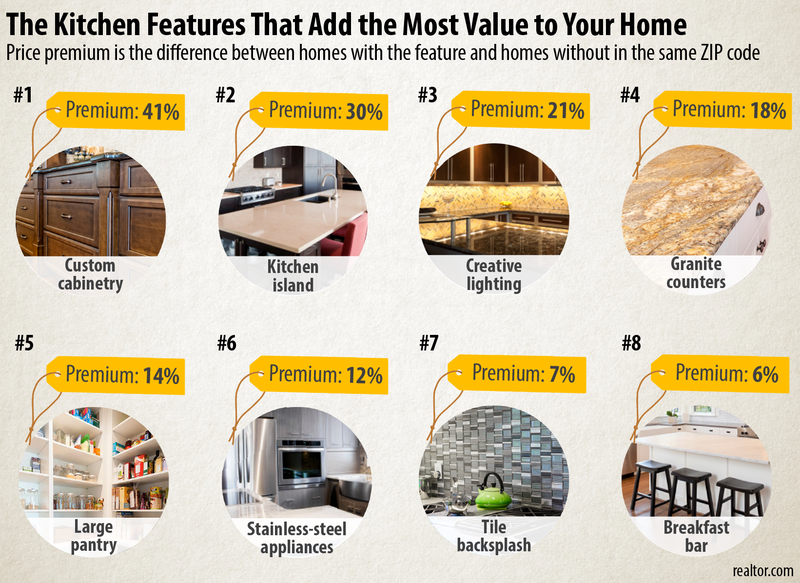 As we can see from our listings, some features are better at adding value than others. Custom cabinets that pull the kitchen together, a center island that holds everything you need, and a capacious pantry to stock with your favorite essentials are among the most frequently mentioned features. At the opposite end of the spectrum, you should probably stay away from over-the-stove microwaves, maple cabinets, and 4 x 4 tile floors—those are so yesterday. If budget is not a concern, having a professional chef’s kitchen is the ultimate dream. Currently, 4.7% of homes on the market describe their kitchen as a “chef’s kitchen” or “gourmet kitchen,” up from 3.3% three years ago. Homes with this feature carry a median price tag of $589,900. 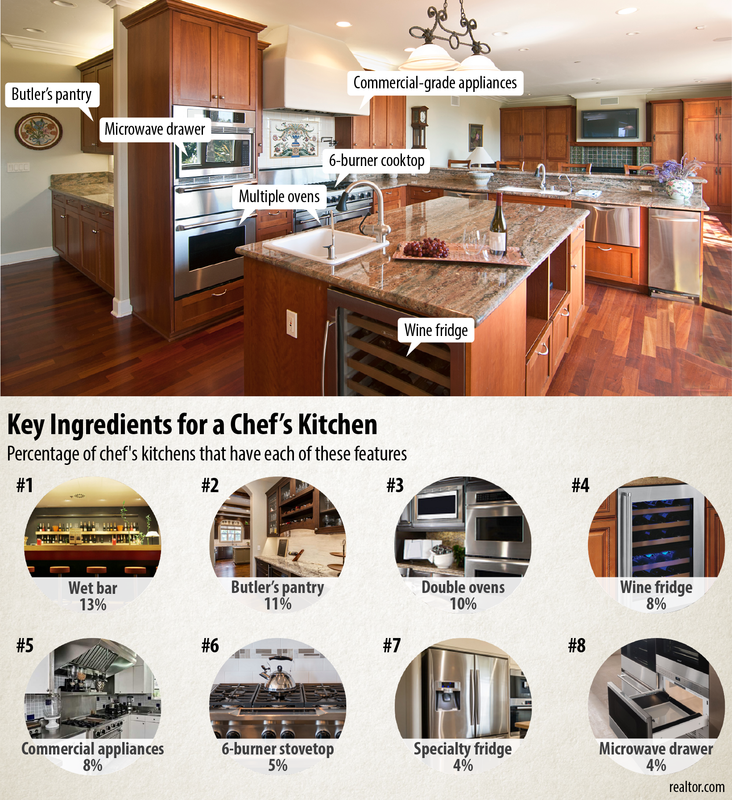 While there’s still no standard definition of what a “chef’s kitchen” includes, we were able to calculate which features are most frequently associated with one. The idea is becoming more and more specific and tangible to homeowners and would-be buyers alike. The No. 1 principle: Think big, and bigger. That means an oversized fridge (it’s even better to have a separate fridge and freezer); dual commercial-quality ovens to separate the main dish and the sides, a six-burner stovetop (or two!) so your pans don’t crowd each other, and a butler’s pantry that serves as a catering station. Those are the most touted gourmet features, but we also couldn’t help drooling over indulgences like a walk-in refrigerator, blast chiller (it cools beverages and food within minutes), and a wood-fired pizza oven. For years, HGTV has been telling us to knock down walls and open up the kitchen, so that families can spend more time together, whether they’re cooking or eating. “I can’t even remember the last time somebody asked me to put a wall in their kitchen,” says Féliz-Grimm. In New England, where many of the country’s oldest homes tend to be smaller, opening up the kitchen and creating a feeling of space is the focus of many home renovation projects. In the Southwest, where balmy weather dominates most of the year, an open floor plan increases natural light and the connection to the outdoors. 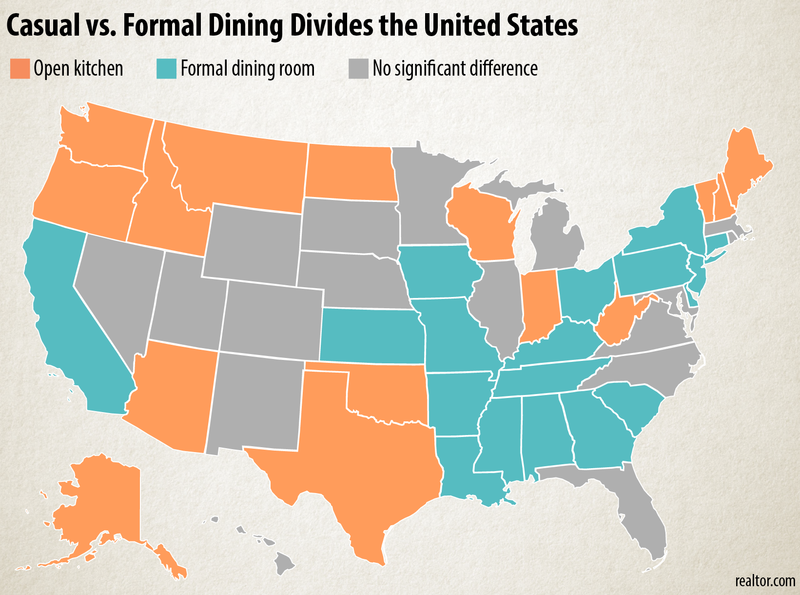 This does not apply in the South, where the formal dining room has been a tradition for centuries. People are far more likely there to enjoy their turkey with all the family in a separate dining room, often lit up with chandeliers and adorned with plush drapery.